Android phones give us a proper platform to stay connected with friends and family. In fact, it is a good place to save our precious moments with them. However, for some reasons, such as the need to change the phone, upgrade the system, repair, restore factory settings, root, sale, etc., we need to transfer our favorite photos, videos, music and other files to the computer for backup, so as not to lose.Thus, learn how to transfer photos from Android phone to PC, Mac, or Laptop is vital. You may think this is hard to do. In fact, things are not as troublesome as you think. It is quite easy if one carries this job in a perfect manner. Here, some ways are mentioned which will make the process of transferring photos from Android to PC easy. These methods will provide you with ease to get access to all your data including photos, videos and so on your personal computer. This app will help you in navigating the phone, send text messages, downloading files and receiving notifications directly from the browser of the computer. It connects the devices via use of Wi-Fi. So, one needs only this app and need to visit the AirDroid.com for accessing all the data of the phone. The most useful of this one is it will assist in locating the device and will wipe its data for the purpose of privacy. In fact, the premium version will allow you to make the calls right from the computer. Install the AirDroid App on the Android smartphone. Now, on the computer, go to AirDroid.com. You can also Sign in with accounts of Twitter/Google/Facebook or QR Code. 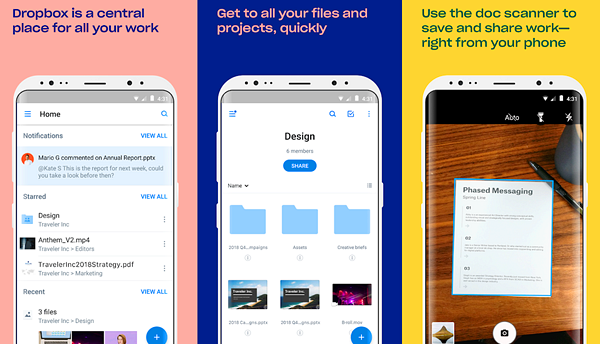 This photo transfer app is free to download and works best with many popular Android phones like the Moto Z2 Force, Samsung S9+ and Pixel 2 XL. 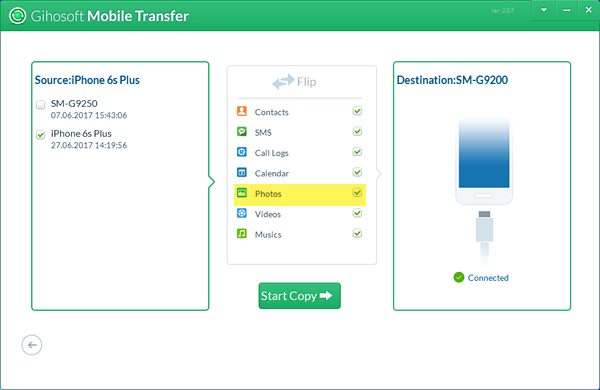 If you do not want to have the option of Wi-Fi, then Android File Transfer is a good option available with you. 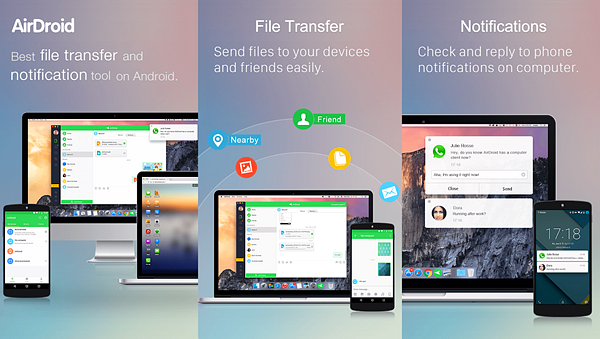 This is the app that works on Mac and will help you with transfer photos from Android to Mac. It works with Mac OS X 10.5 or later. In this case, the Android phone needs to be connected with USB cable. This USB cable can be the charger’s one. Once it is connected, the phone will start appearing on the drive of Mac. Follow the following steps. Now, remove the USB cable from the charger and use this cable to connect the Android phone and Mac. 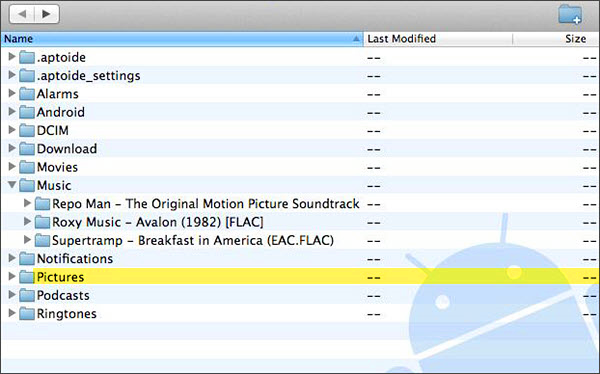 Now, just locate the Android File Transfer on the available list of drives. On finding it, make a double click. Then, you will view the list of applications. You need to open and view the apps. Simply dragging them to desktop and moving them as per your wish let you transfer data. In this technologically advanced world, how to transfer photos from Android to PC is not a very big task. When you have a new phone and without any doubt, you want to have your old data like images, videos and so on, you need something to transfer these data to your new phone. No need to worry at all as Gihosoft mobile transfer software will help you a lot. It has the following features. 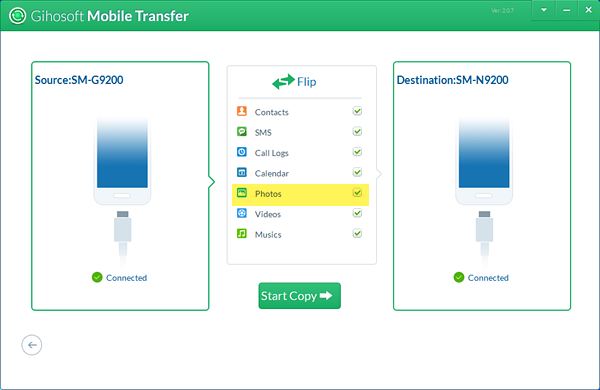 It is the easy and best data transfer solution from phone to phone. The process of transferring is risk-free and secured. So, you need not to worry about the leak of any personal information. The process of transfer involves three parts. Gihosoft Mobile Transfer will help in transferring data between available mobile phones which includes Android to Android, iPhone to iPhone, Android to iPhone, iPhone to Android and so on. Connect the mobile phone with the computer. 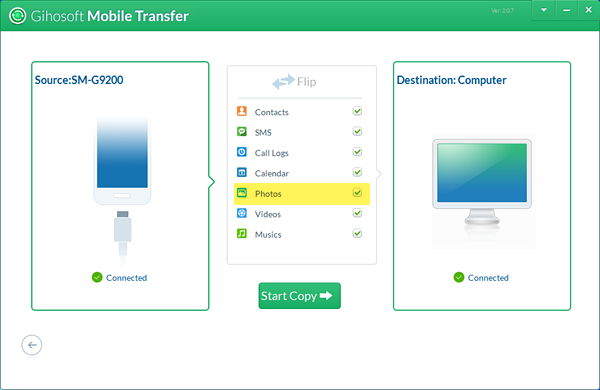 Choose the file type and start transferring: here, you will select the files like music, photos, SMS which you want to transfer. Click on Start Copy. This one will help in taking the backup from the phone to computer in a single click. It will keep all the data secured and safe. Connect the Android phone to the computer. Click on the option of Backup your phone. Select the files and click on Start Copy. Now, choose the place to dive the data. The individual has to wait until the process of transferring pictures from phone to the computer is completed. When you lost the data on phone, then Gihosoft Mobile Phone Transfer will aid in restoring from backups created by the program. Choose the desired backup. 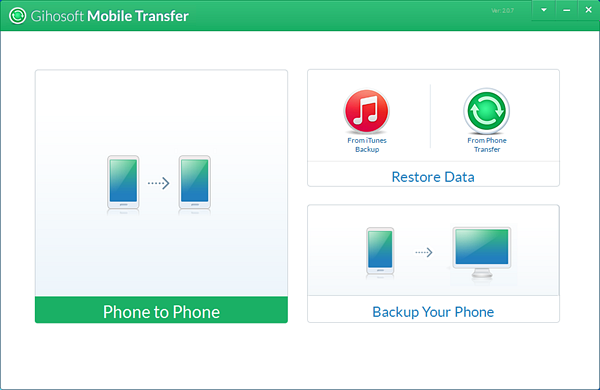 Select the option of restore “From Phone Transfer” or “From iTunes Backup” available in the section of Restore Data. Connect the Android phone to PC. Select the backup copy which will be available on the left side’s displayed list. After selecting the file, make a click on Start Copy option to initiate the process. Firstly, install the Google Photos Uploader App on your computer. Next, install the app of Google Drive Sync. It will synchronize the Drive on the PC or Mac. Now, you need to access Google Drive with the help of Browser. Then Go with the option of Google Photos. Navigate to option of Google Photos on Google Drive. But before that one must ensure about enabling the option of Create Google Photos folder. Now, for synchronization, open the settings of Mac’s Google Drive. Select the Google photos folder. It is another way to transfer photos from Android to computer. This is a free service and will help you in bringing all the photos, videos and docs from anywhere. It is a cloud service which is compatible with almost on all platforms that includes Android, PC, and Mac. Dropbox Account gives you storage of 2GB free memory. Use this app with the same user account on the Android device and Mac. Android will instantly upload the videos and photos from camera to Dropbox. Immediately, you can access these file on Mac. Install Dropbox on the Mac. Now, any file which is synchronized with the Dropbox will automatically be synchronized to all the devices which have the same user account. All these methods are easy to answer how to transfer photos from Android to PC/Mac. Individuals can opt for any one of these as per their convenience. These ways are easy to follow and do not need any extra elements for transferring photos to your computer. Photos are one of the most precious data on our phones, and backing up photos is the best way to protect them from loss. 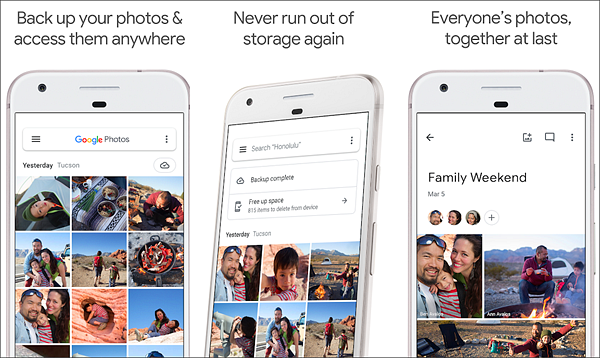 Because when some important photos in the phone are lost or deleted by mistake, we can quickly get them back through the backup. However, in life, not everyone understands the importance of backup, and often backs up important data in their mobile phones. Therefore, how to recover deleted photos without backup is a big problem. 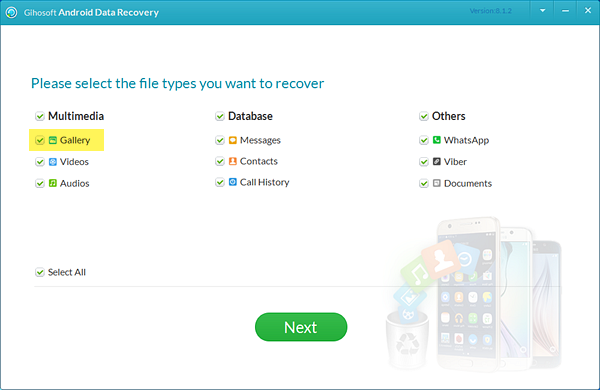 Fortunately, our developers have developed a very powerful software called Gihosoft Free Android Data Recovery, which is specially designed to help users recover data without backup. Support multiple data types, compatible with multiple platforms and systems, you deserve it!